The orange fireball represents the amount of particulate matter in the air in real time, a form of pollution that can negatively affect your health just by breathing. 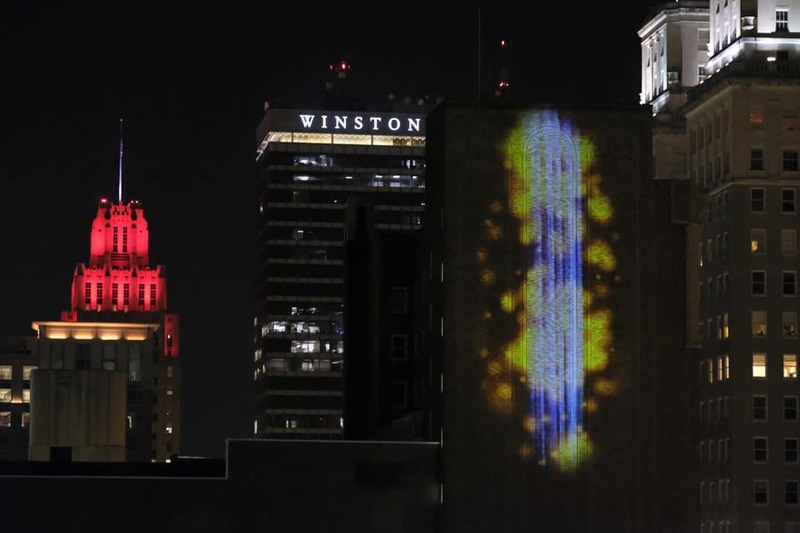 Winston-Salem’s 10-story tall Stevens Center was illuminated last month, displaying a giant animated light art projection of a blue waterfall turning into a fireball. But the art wasn’t just for show — the spectacle represented the amount of particulate matter in the air in real time, a form of air pollution that can negatively affect your health just by breathing. 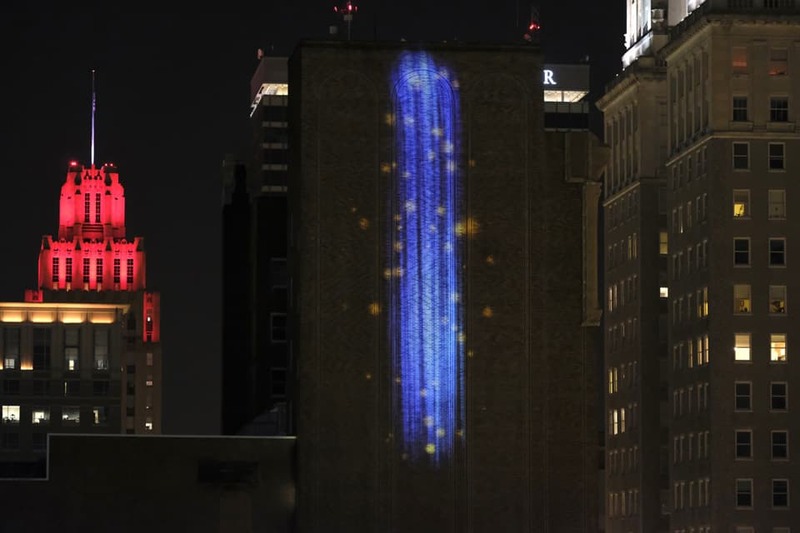 The animation, Particle Falls: Air Made Visible, was designed by artist Andrea Polli, Art and Ecology professor at the University of New Mexico, by using specialized computer software. It is generated by translating real-time particulate matter data from the surrounding air, using a nephelometer — an instrument that takes in air samples and gathers data about the concentration of particle pollution. A computer program then transforms the data into visual bursts of color over the background of blue light. “With this particular exhibit, it’s so beautiful … yet it stands for something that can be so ugly,” said Dr. Stephanie Dance-Barnes, Associate Professor of Cellular & Molecular Biology at Winston-Salem State University. Particulate matter, which occurs year-round, is a mixture of solid particles and liquid droplets, the smallest measuring 2.5 microns or less in diameter – just 1/30th the width of a human hair, according to Clean Air Carolina. While larger particles known as soot affect your health, it is the fine particulate matter that is more dangerous because it can be inhaled deeply into the lungs, enter the bloodstream and cross the blood-brain barrier. There is no safe level of particulate matter. Winston-Salem has been ranked as the 142nd most polluted cities in 2016 and traditionally ranks above the national average of US cities for average annual particle pollution, according to Clean Air Carolina. Sources of particle pollution in Winston-Salem include cars, trucks, diesel buses and construction equipment, landscaping tools, agriculture, industrial facilities, power plants, biomass, and residential wood burning. “For climate deniers, for climate believers — it’s something that you can come down and say, ‘You know what? I may not believe about the climate changing, but I know that I’m breathing that in, and what that means for me,'” said Wendell Hardin, Sustainability Manager of City of Winston-Salem. For more information about Particle Falls, check out this video.